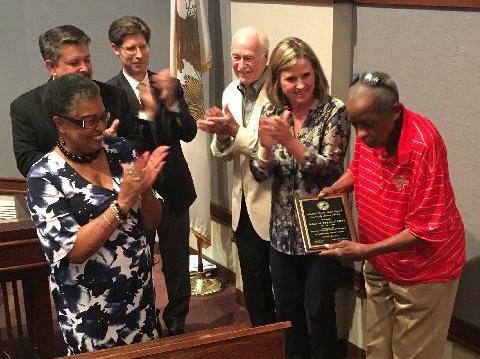 Madison County Board member Gussie Glasper of Venice presents Marvin “Preach” Webb of Edwardsville with the Madison County Living Legend Award. Board members Jamie Goggin, of Jack Minner and Ann Gorman, all Edwardsville, and Chairman Kurt Prenzler (center) watch as he accepts the award. Chairman Kurt Prenzler and County Board members Gussie Glasper, Jack Minner, Ann Gorman and Jamie Goggin presented Webb with the 4th annual Madison County Living Legends Community Service Award prior to the County Board meeting. 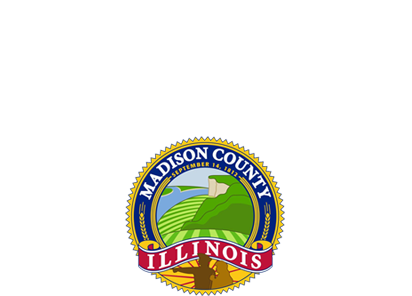 The award is presented to county residents who make extraordinary contributions to their communities and fellow citizens. Due to Webb’s health, the county delayed presenting the award at its February meeting. Glasper said that Webb is a fixture at the county. She said the definition of a legend is someone of extraordinary accomplishments. “I think that fits Preach to a tee,” Glasper said. Glaser said Webb has always greeted her with a smile and a kind word. Since Webb turned 18 he’s been a fixture of downtown Edwardsville. Taking care of merchants as they took care of him. Her turned 82 in January. Webb is known for his friendliness and willingness to help others. He is also known for his honesty and dependability. Through the years, Webb ran errands, took mail to the post office, handed out fliers and helped with activities for businesses and public events around town. Webb attended Lincoln School as a young child but struggled to read and write. Because schools in those days did not provide the special education and individual programs available today for students with learning disabilities, he dropped out. His mother encouraged him to take on responsibilities and took him downtown to introduce him to the merchants. No one remembers a time when Webb wasn’t seen downtown and residents, business owners and employees know him. Webb’s image is stamped throughout the pages of Edwardsville’s history. As the years passed, the city has continued to recognize him as a valued member of the community. “It says a lot about both him and the city,” Prenzler said. Prenzler said Webb is well known throughout the Administration Building. Minner said it’s an honor to recognize Webb as one of the county’s Living Legends. He said he first met Webb in 1952 walking down the street wearing two carnations. Prior to being presented the award, Webb said he was excited about receiving it.